For beginners, the combination of a light microscope with a digital camera includes some surprises. There are obvious discrepancies between the visual impression in the eyepieces and on the screen respectively. These discrepancies are about color impression and image section. 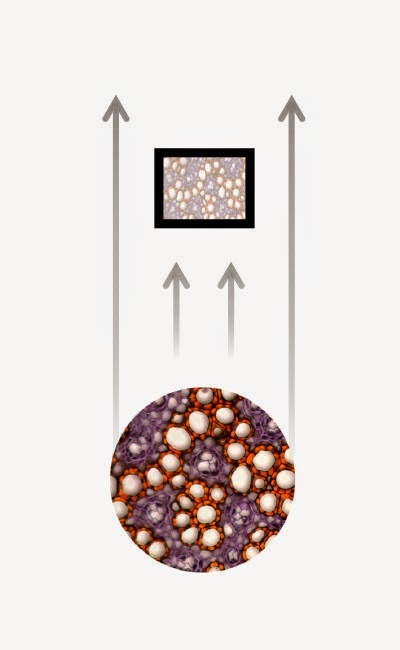 The color impression in the eyepieces may be taken as a reference and depends on the color correction of the objective. The Plan Apochromatic lens design gives best preconditions for maximal color fidelity and resolution. The imperfection of a secondary spectrum, caused by the usage of white light, is compensated for 3 colors, while spherical aberrations are corrected for 2 wavelengths. The result is an impressive image quality without any colored fringes. Especially in colorless black/white samples the absence of secondary spectrum becomes obvious. However, for price reasons, it is the Plan Achromatic quality level of a modern Infinity System which sets the point of reference for most users. bottleneck. 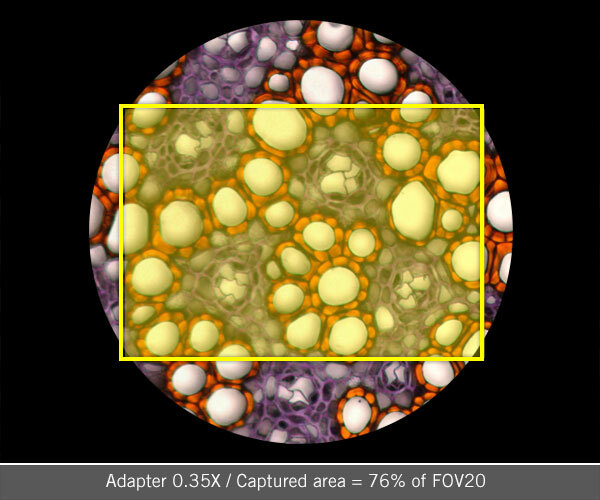 CCD targets are superior to CMOS sensors in terms of color reproduction, but they still lack the dynamic range of the human eye. If it comes to the price point, a CMOS sensor will find his friends. A clever signal processing will lead to a reasonable image quality at an affordable price point. 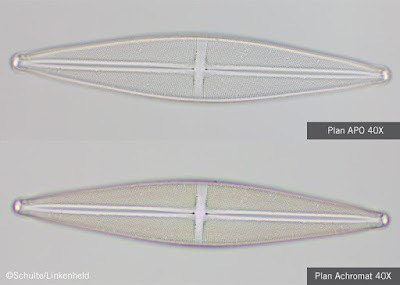 There is one more problem to be solved, as the circular intermediate image within the microscope has to be captured by a rectangular sensor. Microscope manufacturers tend to enlarge the visible area (diameter of the intermediate image = Field Of View; FOV). Chip manufacturers go the opposite direction as the consumer market for pocket cameras and mobile phones requires small-sized sensors. 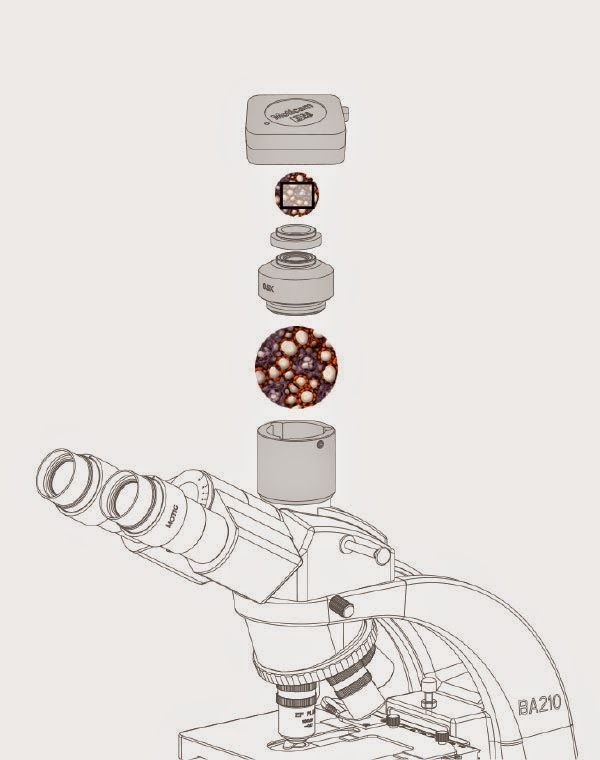 The combination of a typical microscope camera with the photo port of a microscope requires an intermediate piece of hardware, combining optical and mechanical tasks : the C-mount adapter. Its upper part carries a standardized thread of 1 inch outer diameter and 1/32 inch pitch, ready for the mounting of the camera. Its lower part refers to to the microscope manufacturer and the respective microscope model. Despite some homogenisations, even within one brand there might be different interfaces for different microscopes. 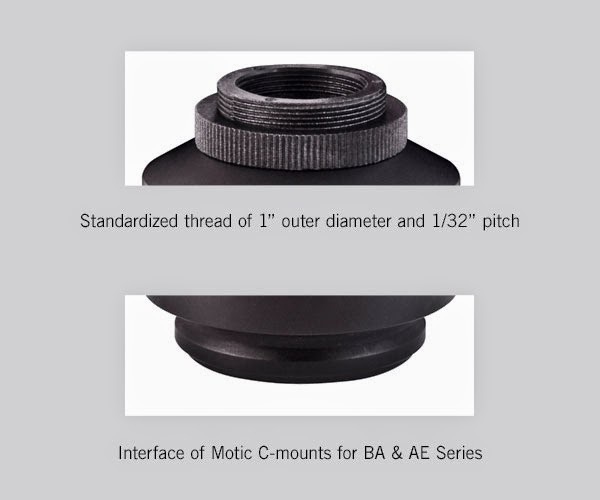 A C-mount 1X without lens is a pure mechanical device for a direct positioning of the camera sensor “on top” of the intermediate image. This combination gives a disappointing image section of 10% Field of View. A camera adapter with a magnification factor ≤ 1 will help. The adapter’s optics “compresses” the intermediate image and thus increases the captured area. 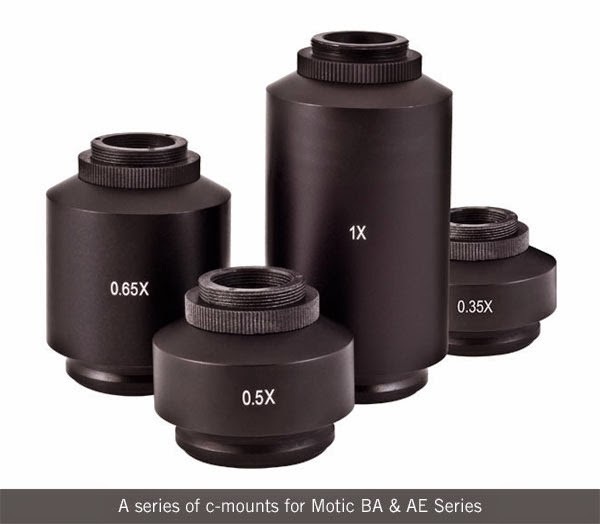 The disadvantage of a reducing C-mount should be taken into consideration. Any compression of the intermediate image reduces resolution as image structures are pushed together: With Great Compression comes Great Reduction (Uncle Ben to Peter Parker). Selecting the camera adapter, the user takes his decision for image section or resolution. 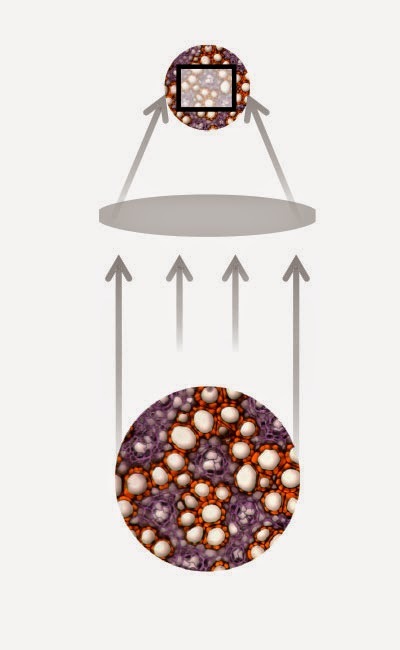 That kind of dilemma is well known in microscopy: remember the setting of the aperture diaphragm which always is a compromise between contrast and resolution. 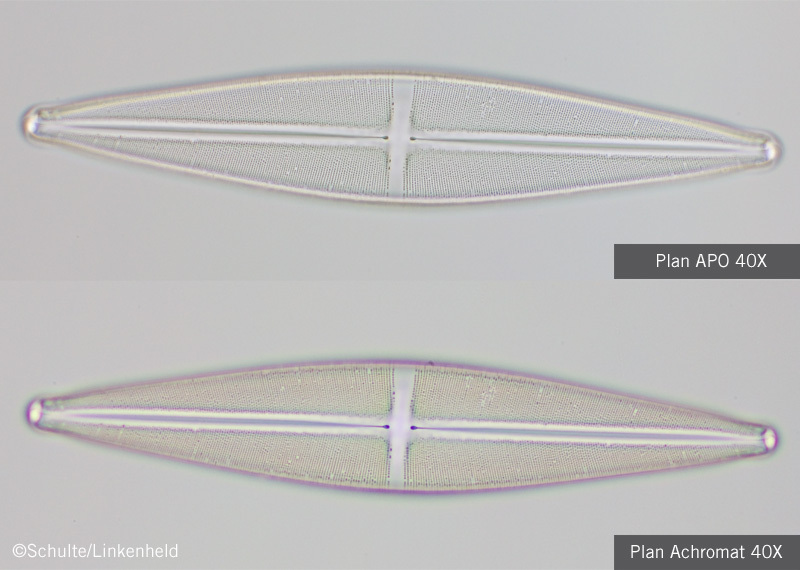 Thank You for sharing this useful and interesting article about microscope features and your products. We are happy to know that you liked it! We are always working on creating new useful tools and articles. Motic Incorporation Limited Copyright © 2002-2016. All Rights Reserved. Powered by Blogger.